Catherine's husband William is second in line to the throne. Source: Getty. It’s no secret that Prince William will one day be king, as the Duke of Cambridge currently stands second in line to inherit the throne, behind his father the Prince of Wales. And when that day comes, Catherine will step into the role of queen consort. Now, reports claim that the Duchess of Cambridge is already being groomed for her future position at the highest level of the British monarchy, with Her Majesty the Queen reported to be instrumental in her training. Royal correspondent Rebecca Long told US Weekly that the Queen has upped Kate’s responsibilities in recent months in order to prepare her for the task ahead. Since returning from maternity leave in October, following the birth of her third child Prince Louis, the duchess has seemingly taken on a greater number of engagements, as well as being handed a number of new patronages by the Queen. 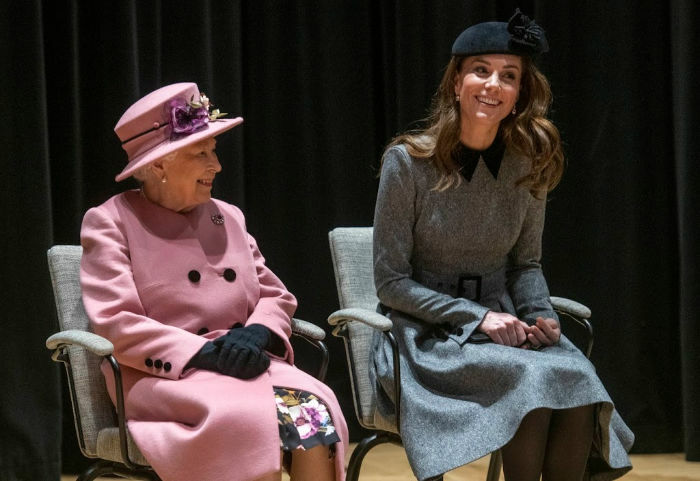 And one of her most recent outings was carried out alongside the Queen herself as the pair visited King’s College London last month, where they reopened Grade II-listed Bush House at the top UK university, as well as meeting with donors, supporters and alumni of the university. Incredibly the event marked the pair’s first ever official solo outing outside of the palace walls, having been joined by Prince Philip during previous joint engagements, before the Duke of Edinburgh retired from royal life in August 2017. The pair appeared to be in high spirits during their first official joint outing last month. Source: Getty. While many royal fans are eagerly awaiting the ascension of Prince William to the throne, with Catherine as his queen, recent polls have indicated that there is not as much enthusiasm about Prince Charles succeeding his mother to become monarch and Head of the Commonwealth. An Australian poll from 2016 revealed that 40 per cent of people were in favour of William being made king, while just 25 per cent supported Charles as the direct heir. However, despite public opinion, The Queen has made every indication she will hand the reins over to her son when the time comes. And when that time comes, it seems the Duchess of Cornwall will also land the title of ‘Queen consort’ by law, due to the fact that their marriage was formalised by the Privy Council in March 2005. The duchess has previously denied that she would take the title, having confirmed in a statement via Clarence House that she wished to “use the title HRH The Princess Consort” when her husband takes to the throne. However, a surprise law may throw cold water on that plan, according to the University of Oxford’s Professor Pavlos Eleftheriadis – who said she’ll be Queen by law, whether she likes it or not. “Camilla will be a ‘Queen’ in the limited legal sense of being the wife of the sovereign,” he told the Daily Star. Eleftheriadis added that while she can still choose to be known as ‘The Princess Consort’, her official title will be a matter for Charles to decide on. Either way, she’ll be Queen on paper. What are your thoughts on this story? Do you think Catherine will make a good Queen consort?